How Do I Fix Proxy Certificate Error In Outlook? Shared Hosted Exchange uses RPC over HTTPS protocol to connect through a proxy server. The proxy server provides a certificate to protect your connection. BrowserSafeguard and other software that is used to capture HTTPS traffic can replace the Exchange proxy server which makes certificate validation impossible. In this case Outlook will not connect unless the software is disabled or removed. You simply need to remove the application to fix the error. How Do I Find and Remove It? 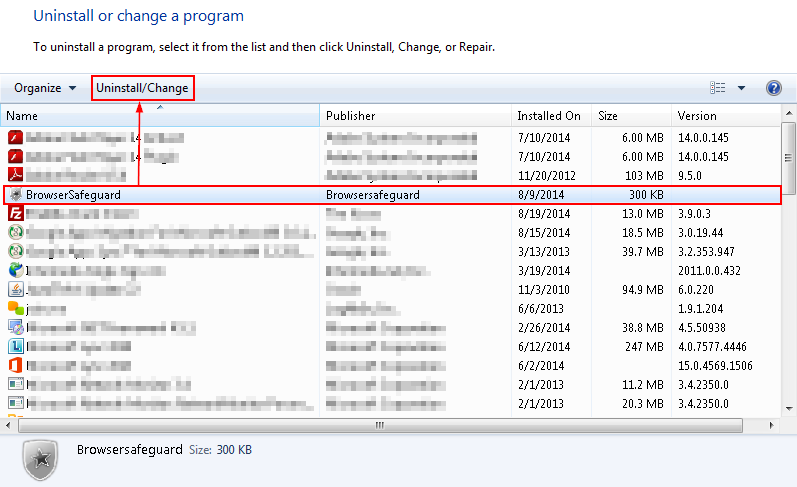 Find BrowserSafeguard or RocketTab or Wagam > Click Uninstall/Change. 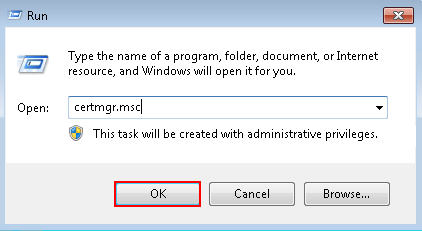 Go to Start > Run > Type certmgr.msc > Click OK. Expand Trusted Certification Authorities and choose Certificates. 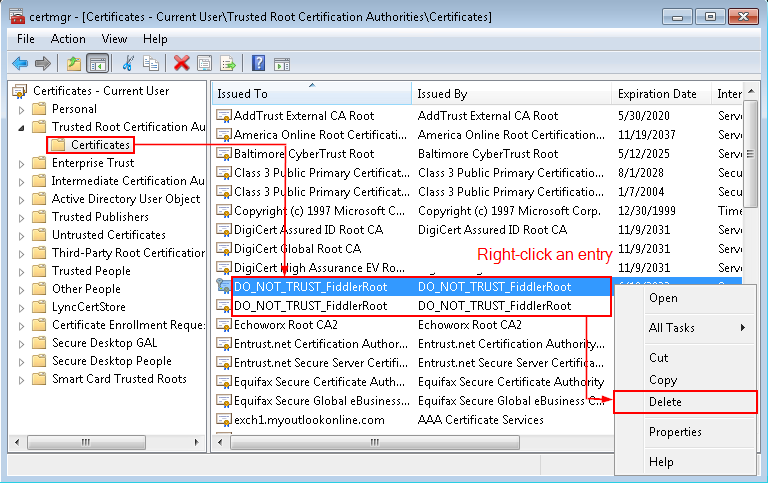 Remove any certificates with DO_NOT_TRUST_FiddlerRoot in the name. How Do I Protect My Computer from This? Install an anti-virus and keep it up-to-date. During installation of free software pay attention to everything you see in the installation wizard. Choose Custom installation option instead of Standard or Quick/Express to make sure you install only the things you need. Never install software through so-called installers. There is always a way to directly download freeware applications from their publishers’ websites. 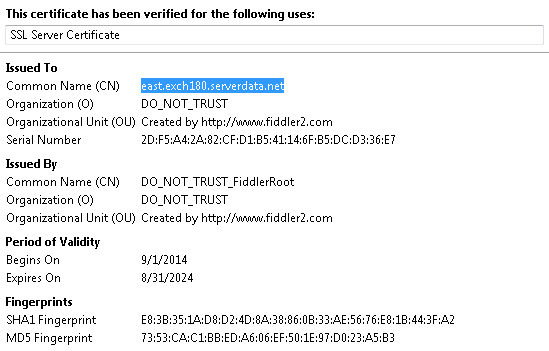 The certificate is used for HTTPS traffic interception. If it is installed you may encounter website access issues using HTTPS. BrowserSafeguard is marked as malware by multiple anti-virus scanners, for example McAfee Antivirus, AVG, ESET NOD32, avast! etc. The software modifies registry and creates scheduled tasks to make sure that it is always running and performing operations such as updating ad lists. BrowserSafeguard utilizes Internet connection to download data which may lead to lowering connection speed at certain timeframes. The software is ad-enabled, meaning that it will display its own ads on websites you visit. This is the reason why it is distributed along with freeware applications. What Other Programs Cause Certificate Error?